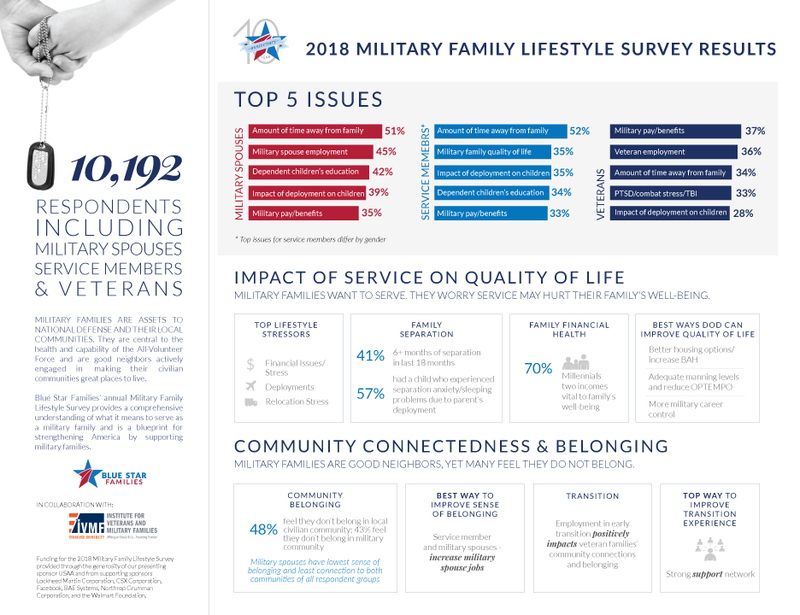 The Blue Star Families annual Military Family Lifestyle Survey results, in collaboration with Syracuse University’s Institute for Veteran and Military Families, are here! With over 10,000 respondents including service members, veterans, and their families, the #BSFSurvey received the highest response rate since its establishment ten years ago! The largest survey of its kind, it is used by policymakers in D.C. and across the country to learn about and meet the most pressing needs of military families like yours. Quality of Life: Time away from family, military spouse employment, and military child education are top issues for military families. Military families want the DoD to improve their current quality of life by offering better housing/increasing BAH, maintaining adequate manning levels/reducing high operational tempo, and allowing more control over service member’s career. Economic Stability: Financial issues/stress was the top stressor for military families for the first time, followed by deployments and relocation stress. Social Isolation: A majority of respondents feel connected to institutions and networks within their communities, yet many don’t feel they belong in them. When feelings of community belonging are not met, additional challenges around mental health can arise. To view the 2018 key findings video and to download 2018 results for a more in-depth look, visit bluestarfam.org/survey!